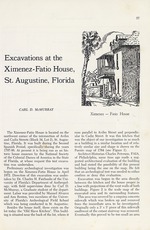 Article pertaining to the Ximenez-Fatio House, 20 Aviles Street, St. Augustine, Florida. history as it epierges from archaeological research and the study of written records. Membership is open to both professionals and interested laymen. ogy, with field supervision done by Carl D.
which was being conducted in St. Augustine. Puente map of 1764 (see Figure 1). confirm or deny this evaluation. excavated area and its surrounding features. from the immediate area to be investigated. southwest of the extant stairway was removed. turned to the Colonial Dames for disposition. fact types were window glass and wire nails. ing the restoration work done in 1941-42.
coquina iristead of oyster shell). Historic St. Augustine Preservation Board. against the south wall of the kitchen building. had obviously not been subjected to the fire. block foundation up from lower right corner of photo. excavated area (covered by gravel). building on the Puente map of 1764. Northern St. John's Archeology, Florida. sity Publications in Anthropology, No. 62. 1968 "Spanish Majolica in the New"World." America. Alfred Knopf. New York.